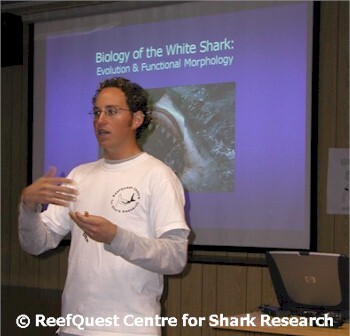 The ReefQuest Centre for Shark Research is a not-for-profit research, education, and conservation organization. We do what we do because we love it. But our goals are ambitious, often extending far beyond what we could hope to accomplish alone. Thus, we must advertise our needs, in the hope that at least a few individuals or organizations will help us pursue our goals. For example, we are always grateful to underwater photographers who allow us use of their images, which greatly enhance the attractiveness and information content of these pages. In appreciation for the enormous kindness and generosity we continually receive from such outside sources, we also feel an obligation to share — within limits of our availability — our accumulated knowledge with students, teachers, media professionals, and fellow researchers. We therefore invite members of the general public and fellow researchers to contact us with their shark-related questions and concerns. We are glad to address those queries we can on a volunteer basis. For queries from media professionals and corporations requiring extensive work on our part (on the order of days or weeks), we are often willing to help in a consulting capacity.